It took a whole calendar year, but assets under management (AUMs) of the Indian mutual fund industry have once again crossed the Rs 6 lakh crore (Rs 6 trillion) mark. The same mark had first been achieved in May 2008, right before AUMs dropped precipitously, as part of an industry-wide slump. Leading this recovery has been Reliance Mutual Fund, which in May became the first Indian mutual fund to cross an average AUM of Rs 1 lakh crore (Rs 1 trillion) for an entire month. With 7.1 million of India's estimated 30 million mutual fund investors, Reliance is right now the clear industry leader. 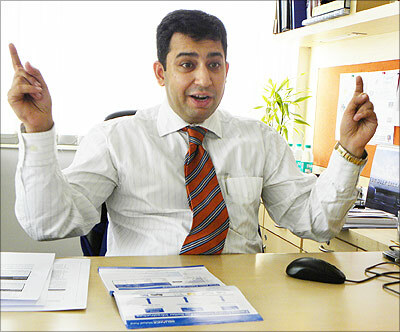 Rediff.com caught up with Reliance Capital Asset Management chief executive officer Sundeep Sikka at his Churchgate, Mumbai office. 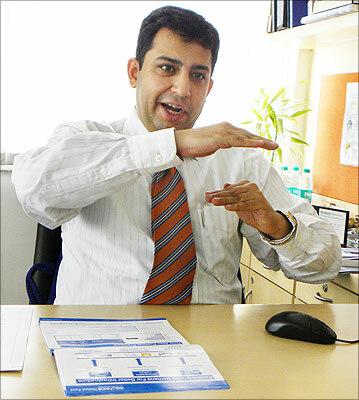 Sikka, who heads Reliance Mutual Funds, explained the company's continuing success, the state of the Indian mutual fund industry and what potential investors should look for in the future. Congratulations on becoming the first Indian mutual fund to cross an average AUM (asset under management) of Rs 1 lakh crore. What is the secret of your success? In India, mutual fund penetration is about 3%. In some Western countries, it's 50-60%. We have about 40 crore (400 million) people with telephones. We have about 25 crore (250 million) people with bank accounts. We only have 3 crore (30 million) people involved in mutual fund investment. Much of our savings is just sitting around, instead of being put to work. We believe this should change. So what we at Reliance MF are trying to do is to channel India's mammoth domestic savings into the capital markets. India's domestic savings, if released into the market, would be a positive force on their own. So for us, it's been a dream and a vision to have every Indian household invested in mutual funds. We've been pro-active and aggressive in pursuing this, and that's made us a success. As for this recent distinction, it doesn't mean that anything is different. Yes, we've crossed the average AUM of Rs 1 lakh crore boundary; but the effort to get here has been going on for six years. This effort will continue in the future too. Also, while I'm very honoured by this distinction, I'm most proud of being India's most trusted mutual fund. Three years, back-to-back-to-back, AC Nielsen has rated us the most trusted in India. It's great to be the biggest. It's fantastic to be the most trusted. But to have the highest marks in both size and trust is a huge achievement. How badly has the global financial meltdown affected India's mutual fund industry? How did it affect Reliance mutual fund? I'll put it like this: the previous fiscal year, 2008-2009, has shown that India is neither insulated nor isolated from outside forces. Now, we are truly part of the global economy. So of course there were effects, as you saw with dramatic falls in the markets. But I'd also like to mention that India is an amazing domestic consumption story. We still have 6 per cent annual growth. If this 6 per cent growth was happening in a Western country, they'd be worried about the economy overheating! So you have to consider that when you hear people say, "Oh, the Indian economy is slowing down." We, as a fund house, have been very consistent. During the financial crisis, we were able to use cash as a hedge against the worst effects. Do you think the world economy is on a way to recovery? Or is it just a temporary phase? How about in India? Is the worst over? How do the Lok Sabha poll results factor in? To understand what's happening, you have to first understand what happened. Major banks in the West failed and liquidity evaporated. This had far-reaching effects all around the world. But things are now stabilising and improving, especially in India and in certain other Asian countries, like Indonesia. There are positive signs even in the West, too. On Monday, General Motors declared bankruptcy, but the markets hardly reacted at all. If this had happened six months earlier, there would have been a major negative reaction. So things are looking better. In India, we certainly have seen an upturn recently. While it's impossible to predict the exact direction things will take, the signals are very encouraging. We believe that, at least in India, things are definitely going to keep improving. And while the upturn cannot be solely attributed to the Lok Sabha poll results, the government being stable is definitely contributing to a bull run. Our view is that we're entering a long-term bull run. It's the right time to be in India. What are the signs that India is already on its way to recovery? Go to the airports, they're crowded. People are still flying. Go to the malls, they're crowded. People are still shopping. Go to the showrooms, they're crowded. People are still buying cars. You have to be able to gauge the pulse of the market. Some times, we in the industry and also those in the media, lose sight of this pulse. And the current pulse shows that we are most definitely not in a recession. So who gets the credit for India averting a major crisis? We need to compliment the regulator, for controlling things very nicely. The regulator acted prudently and conservatively. Also, India in general has a more conservative investing culture. You must remember: when the distance between a tangible asset and its accompanying financial instrument increases, it can lead to big problems. That in large part is what happened in the West. There were layers and layers between tangible assets and the related financial instruments. That can be dangerous. In India, we don't have this phenomenon, so we were shielded from some of the worst effects. What are your expectations from the new finance minister? And what is your Budget wish-list as CEO and an individual taxpayer? We have a dream team in place. It's a very knowledgeable group with a clear mandate from the voter. So I expect great things. As a CEO and as an individual, I would most want to see the government focus on infrastructure and education. Those are the two most important issues, in my mind. You work on those areas and it could have a long-reaching positive effect for the country and the economy. As per the World Bank, India has a huge, almost unprecedented opportunity to invest in infrastructure. So this must happen. There's a lot of opportunity in public transportation. Look at what Delhi's achieved with the metro (rail), and now what Mumbai is looking to do with the Bandra-Worli Sea Link and the upcoming Metro. So to me it's clear that our biggest opportunity is in infrastructure. What is your message to prospective investors? 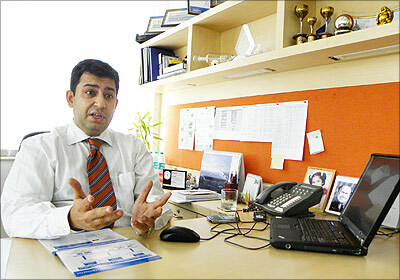 What points should they keep in mind while buying mutual funds? One message: Keep investing. Be a long-term investor with a plan and a vision, not a short-term investor. Also, you should never have 100% equity or 100% debt. You need a healthy balance to maximise your wealth growth potential. Review your portfolio regularly, but don't watch it obsessively. I honestly believe that, unless you do it for a profession, stay close to the financial world, but not too close. It's important to go to the experts. You can diagnose yourself when you're sick. You can give yourself medicine. And sometimes it works. But you'd be smart to go to the doctors, because one mistake can hurt you tremendously. It's the same way with investing. One bad mistake can mean financial suicide. So it's important to go to the experts. 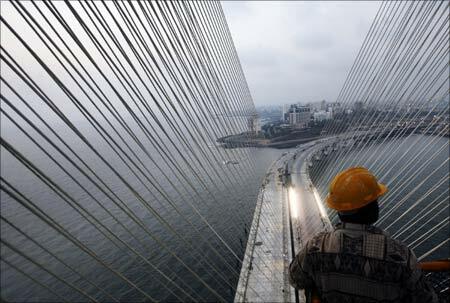 Image: A worker stands on top of a tower at the construction site of the Bandra-Worli sea link in Mumbai.